"We didn’t get to go in the terrain park," lamented Little Lucky, age nine. And that about says it all. The kid is just mastering linked turns and conquering intermediate runs on his snowboard, but his mind’s eye is set on riding rails, shooting gaps and hucking boxes in terrain parks. Or, maybe there’s a driving appeal to terrain parks that kids who wanna be hip—or who are hip—simply can’t ignore. Either way, according to the National Ski Areas Association (NSAA), some 89 percent of their member resorts create some kind of freestyle terrain and/or park for their skiers and riders (2007). And, as we learned in Build a Terrain Park and They Will Come, major ski/ride centers feel competitive demand to build more, better and larger parks. Now, some destinations, as if in a natural progression, are transforming from having terrain parks to being terrain parks. Here are three that lead the pack. Echo Mountain Park (www.echomtnpark.com). Set a short, 35-mile drive outside of Denver, these guys have taken a defunct small ski area, Squaw Pass, and reinvented it as the ultimate park. Their concept is to forget the frills and natural terrain thrills, while creating an environment that reeks of park culture and ultimate cool. Transworld Snowboarding has called it "the anti-Vail." Elevation: they sit at 10,650 feet. 100% Snowmaking: at that elevation, there’s more time to make snow. Natural Snow: they average 215 inches a year. Combine those elements with ready accessability for urban and suburban kids, elimination of frills like expensive food and high lift ticket prices, fully lit facilities, the ambience that park -rats love (lots of music, etc.) and you’ve got a modernist formula for success. Boreal Mountain Resort (www.borealski.com). Boreal was among the nation’s first resorts to embrace snowboarding. It offered one of the first terrain parks (Jibassic Park). North Tahoe’s first indoor skateboarding facility was installed here. In 2005-06, Boreal debuted as Northern California’s first and only all-mountain terrain park. Boreal has also installed additional on-mountain lights to offer the country’s first night superpipe. Boreal has made it policy to establish a bond with the so-called "youth market" (pre-teens through college age), highlighted by what resort marketeers call an all-mountain terrain park. Listen to director of marketing Jody Churich: "Because Boreal’s park is of such high quality, it carries street-cred. Youth and teens are fickle. They’re constantly bombarded with endless choices and it only takes one experience, either good or bad, for them to either decide to return to Boreal or visit another resort. 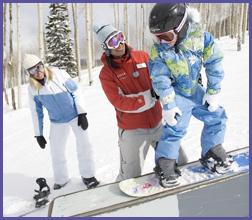 Within the realm of winter sports—specifically terrain parks—we’ve found that most kids place a premium on quality. That means we need to deliver every day." A highlight is the resort’s Expression Session, a weekly Friday night competition. It’s a huge success, according to terrain park director Eric Rosenwald because "First, it’s a night event; second, it’s a terrain park contest predominantly entered by snowboarders; third, it encourages competitors to show their individual style, skill, and creativity. It’s exactly the kind of unstructured opportunity [the kids want] to show athleticism." Boreal appeals to kids who want new experiences, whether they’re first-time ski and board sessioners or experienced huckers, by creating ever-inventive terrain park features of some one hundred different sizes and shapes, skiing/riding until 9 p.m. daily, and an overriding friendly vibe. Check out the realigned Kidz X Park and mini halfpipe. The commitment here is, like, total. Whaleback Ski Area (www.whaleback.com). Here’s another small ski area, readily accessible from the Interstate (I-89) and not too far from major northeastern population centers, that was shuttered and is coming back with an emphasis on freestyle and jibbing. Closed for four years, Whaleback holds just 30 trails covering 85 acres, but in its current incarnation, the focus is on freestyle, moguls, snowboarding and skateboarding—including a 10,000-square-foot indoor skate park, night skiing, freestyle team development and educational programs with schools. The hope is to avoid the area's previous financial problems by opening during the off-season to mountain bikers, inline skaters and skateboarders. "We're basically in the early stages of our dream here," ownership partner Evan Dybvig, a former moguls national champ and Olympian told the New York Times. "Some of the best training for freestyle comes from inline skating and skateboarding," he added. "There's just such a natural synergy between these sports." The hill is literally littered with parks and elements like picnic tables, stairs and rails. And the Jawbone trail sets up with competition sized moguls. As with Echo Mountain, Dybvig thinks this kind of facility is best developed at a small snowsliding area because major resorts have too much on their plates and too wide a range of customer demands to satisfy. "The big resorts are fighting for the mass market, and at a small ski area you can control everything," he told Freeskier. This kind of resort, he continued, offers "no better way to support the athletes and the freestyle culture. We don’t want to be stifling it. The goal is to let kids realize their full potential." Kingvale Terrain Project (KingvaleTerrainProject.com). Kingvale is the first rider owned, park mountain in the world. Located in the Sierra Nevada 11 miles west of Truckee, Kingvale offers an intimate atmosphere for riders to push their progression. Tickts for the 08/09 Season are only $20 a day and $99 for a season pass. ...... Mitch Kaplan is the author of The Unofficial Guide to the Mid-Atlantic with Kids, The Cheapskate’s Guide to Myrtle Beach and The Golf Book of Lists. He is a contributor to The Unofficial Guide to New England & New York with Kids and to the annual guide Ski America & Canada.